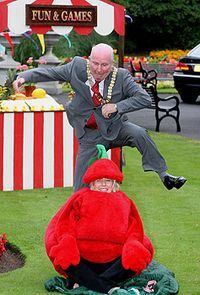 The original headline for this item, "Mayor that accidentally kicked giant human tomato in the head costs council £24,000," was very good but not quite accurate. 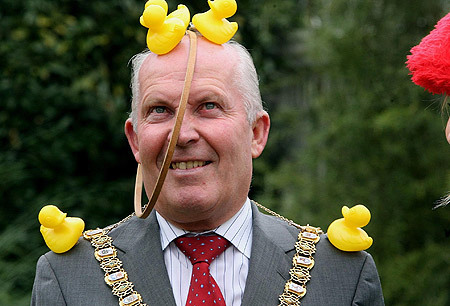 Jim Rodgers, who at the time (September 2007) was Lord Mayor of Belfast, technically did not kick the tomato but rather kneed it in the back of the head when he tried but failed to leap it for a publicity photo. Certainly the resulting photo (right) makes it appear as if he is winding up to try to decapitate the tomato with a running kick, but that is an illusion. It is also probably not very good publicity. The tomato, which in human form is Belfast City Council employee Lorraine Mallon, suffered a slipped disk after being jumped by the mayor, and brought a negligence case against the council. (Rodgers was making the leap in his official capacity, as part of an effort to generate publicity for a gourmet food fair.) Last week, the council agreed to settle, paying Mallon £24,000 (about $38,000 US) and agreeing to pay her legal fees. Rodgers said he would have had no trouble making the jump had he not slipped on wet grass during his run-up. "I'm very fit and look after myself," he said, "but it was just one of those unfortunate things." Rodgers said there had previously been "three false runs," although it wasn't clear whether that meant he had successfully cleared the tomato three times prior to the fateful incident. — he is clearly a good sport. These things happen. I think it was Winston Churchill who said that you can't achieve much in life without bruising a few tomatoes along the way, so let's give at least some credit to Jim Rodgers for being willing to give it a try.